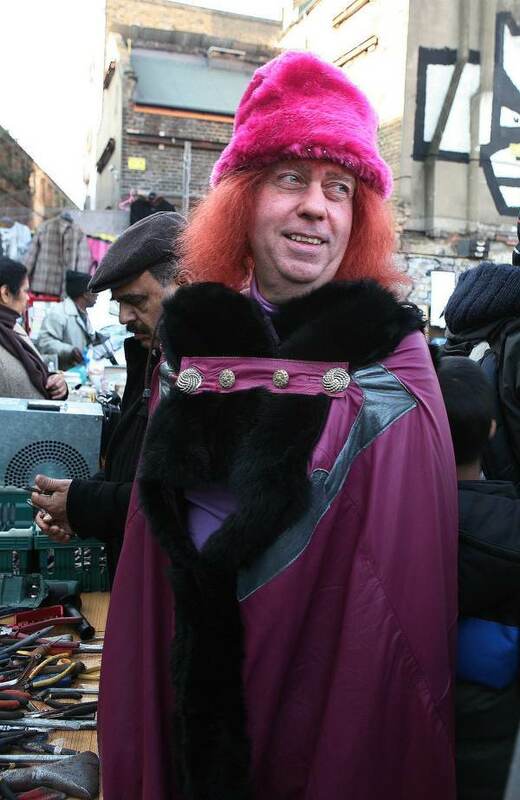 Trendsetter, Mark Petty, rang me to announce that he was returning to Brick Lane. 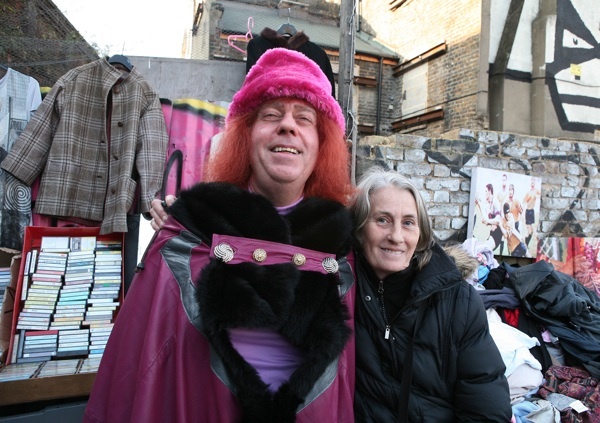 Even though he is one of the bravest people I know, Mark has suffered a crisis of confidence over recent months and I had missed his regular presence at the market, bringing such delight and joy to the weekend crowds with his multicoloured outfits. So naturally, I was delighted to hear the good news and offered to accompany Mark to show him moral support. 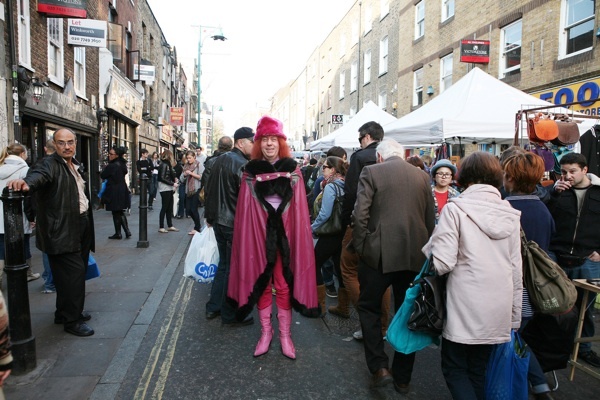 And Spitalfields Life contributing photographer Colin O’Brien agreed to come along too and record the auspicious occasion. 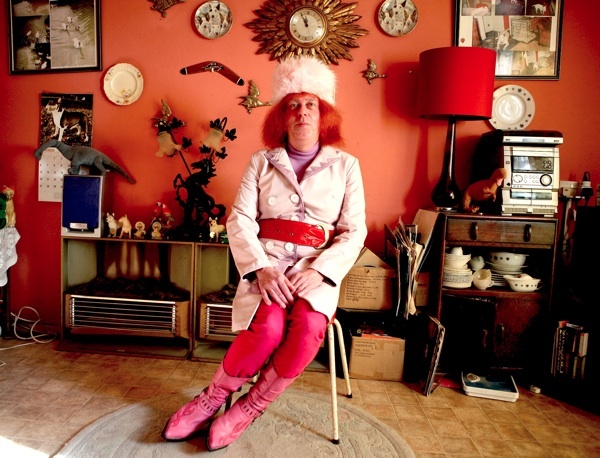 When we arrived at his small flat in a quiet corner of Bethnal Green last Sunday, Mark was deliberating over his choice of outfit. 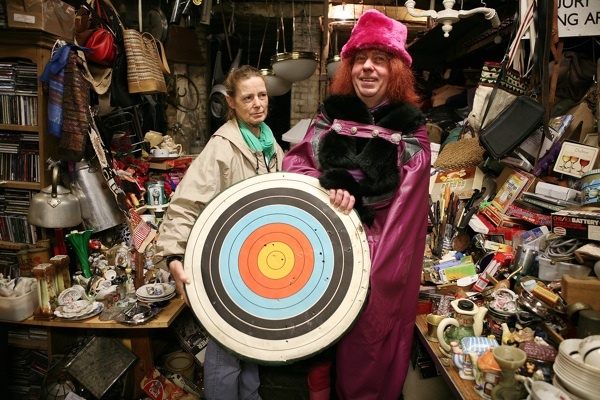 Even though he has three wardrobes full of clothing, Mark declared he had nothing to wear. 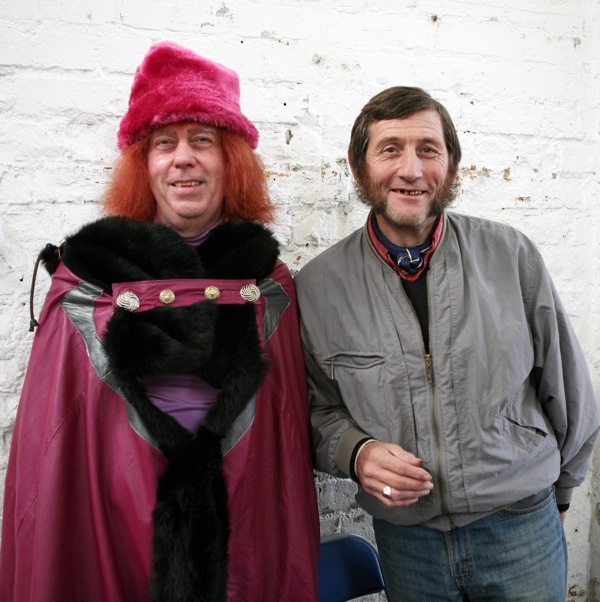 However, we were delighted to get this opportunity to view more of his original designs, especially admiring his Mrs Slocombe tribute coat with its co-ordinated pink fluffy hat resembling a coconut marshmallow, that he wore to open the door to us. 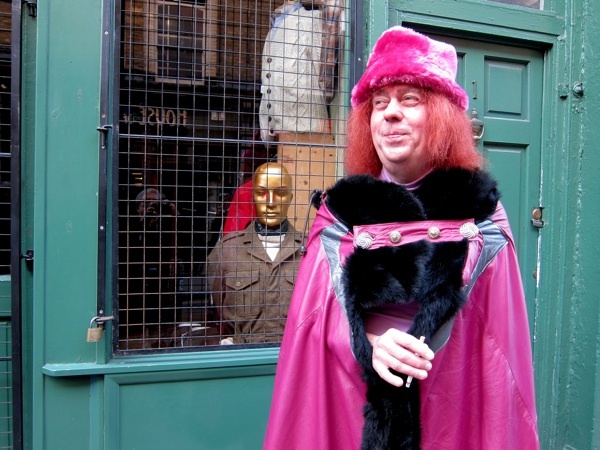 Prudently, Mark decided to wear one of his fur-trimmed leather capes to protect himself against the breeze that had arisen that morning, which just left a choice between options in red, white and pink. 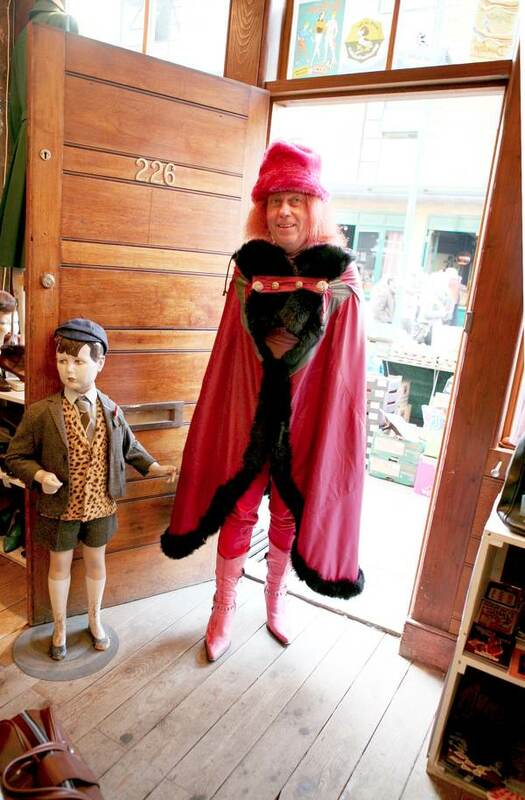 Mark chose the pink cape to match the pink cowboy boots he was already wearing and – as he pulled the cape around him and set the matching furry pink cap in place – he revealed that this outfit was a tribute to Boudicca. In fact, the sophisticated detailing around the neck was drawn from the Celtic torques, those metal collars that chieftains wore in days of old. 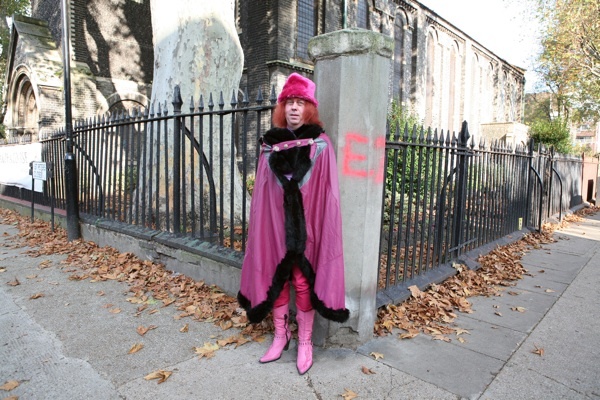 I would like to have heard more, but already people were leaning out of cars to cheer,“Where’s the party?” Mark acknowledged these passing fans with a discreet wave yet concentrated on keeping as steady a pace as he could, hobbling along in his stiff leather boots. 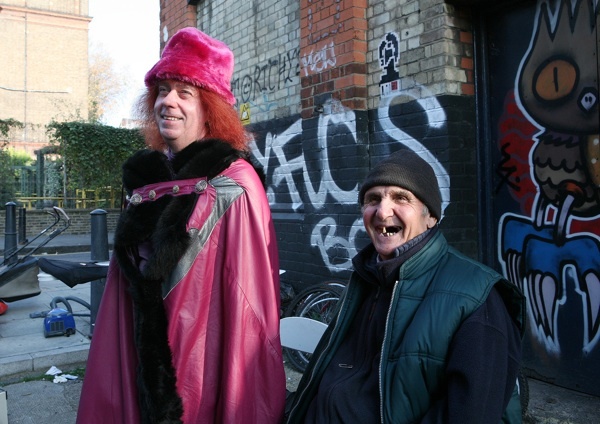 Then, turning into Cheshire St, we arrived at Coppermill Market where all the stallholders greeted Mark with startled enthusiasm, their eyes lighting up at first sight of him – setting a pattern that was to be amplified throughout our morning in Brick Lane. 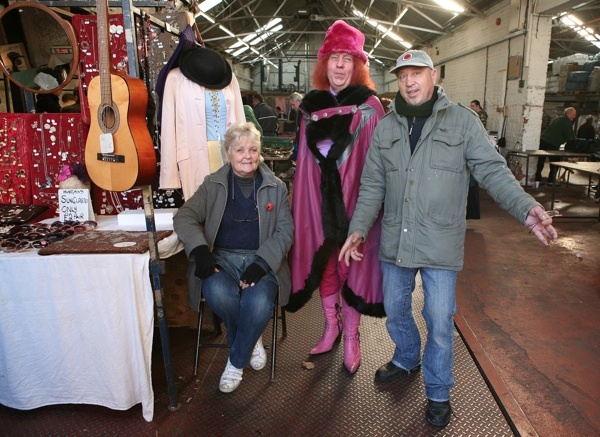 “He always comes and cheers up the market,” Ann, who has been coming from Basildon every Sunday for forty years, admitted to me fondly. 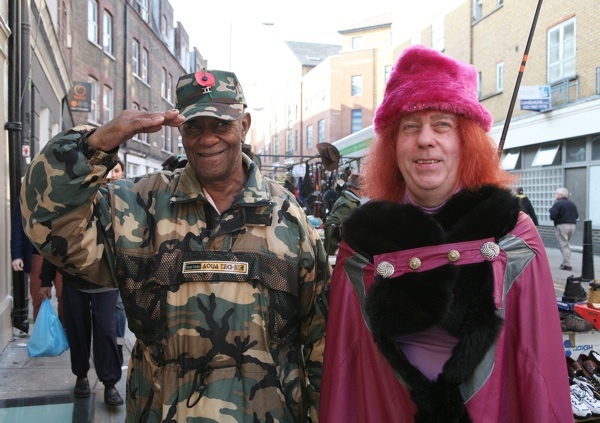 Joe & Steve, anti-fur protesters, were keen to have their pictures taken with Mark – who only wears fake fur – before commencing their protest outside Beyond Retro. 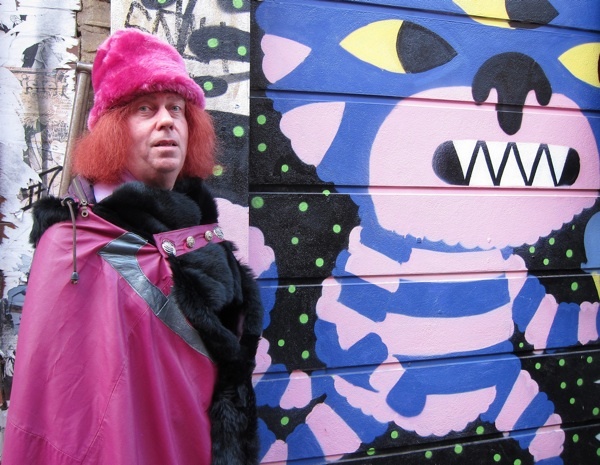 “Even wearing vintage fur promotes the wearing of fur,” they assured me. 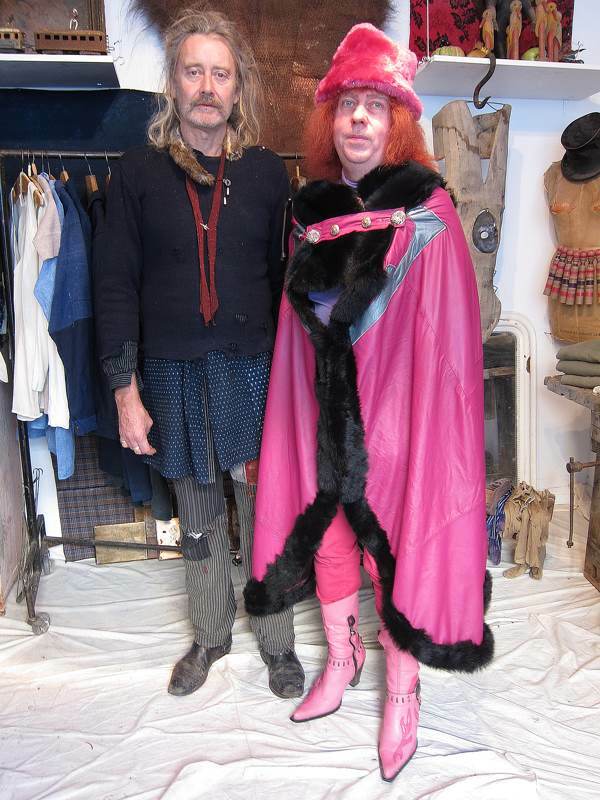 Our next stop was Richard & Cosmo Wise’s shop where the newest clothes are at least seventy years old and it was my delight to introduce Richard and Mark, individuals who dress utterly differently yet with equal inventiveness. 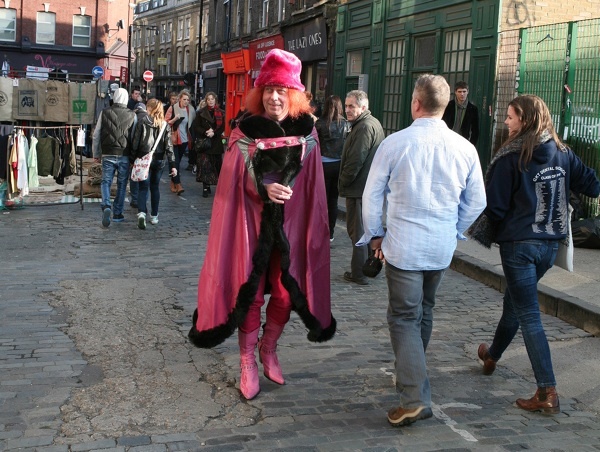 Walking into the Sclater St yard, between the narrow lanes of stalls crowded together, a cheering grew among the stallholders breaking into sporadic applause as hundreds turned their heads in wonder at Mark’s extraordinary outfit. 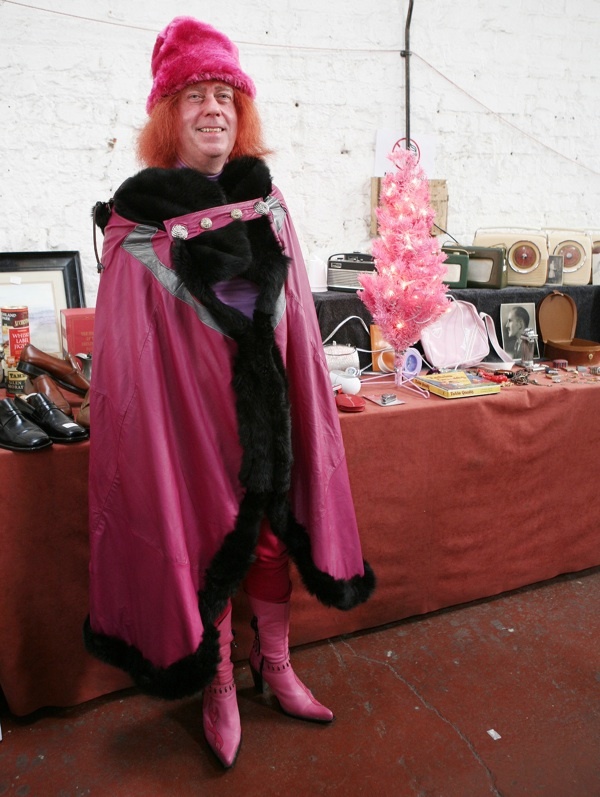 And Mark beamed with pleasure, assuming a demeanour of such regal confidence as if he were the long-lost prophet returned or a super hero come to save the world, protected by the magic armour of his full-length purple leather cloak. 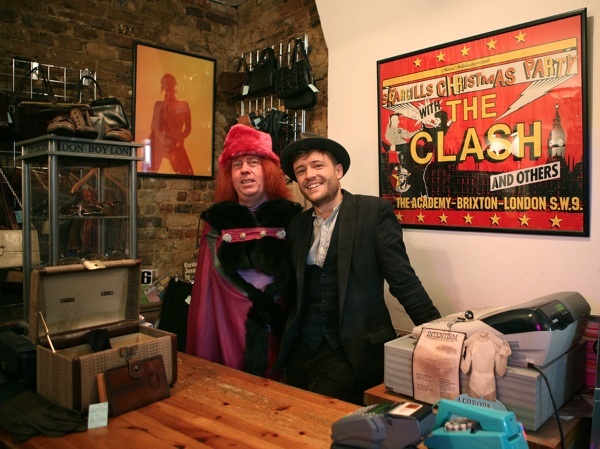 Our final stop was Batty Fashions in the Bethnal Green Rd where Mark’s outfits are made and where the members of the Batty family lined up to greet their best customer with pride, because Mark is a walking advertisement for the imaginative possibilities of what can be achieved with coloured leather. Following just behind Mark through the crowds that morning, I got to witness the wake he creates of double-takes and disbelief – people asking themselves, “Did I just see what I thought I saw?” At any moment, I expected music to commence and everyone to star singing and dancing. I had the feeling I had walked into a big-screen musical comedy, yet this was something even better because it was real and, aside from a couple of anxious cigarettes, Mark carried it off consummate aplomb. 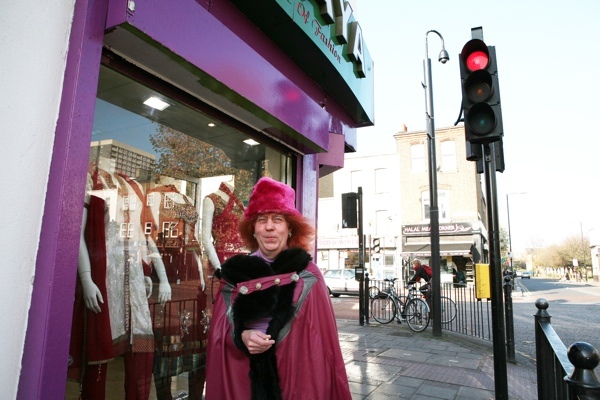 On behalf of the rest of us, Mark asserted his point, daring to stand up for the right to be different and, after we said our good byes, I watched him wander off homewards down the Bethnal Green Rd, hobbling contentedly as he went. Be it known throughout the East End! Let the pigeons sing it from the rooftops! Let the bells of Christ Church peal! 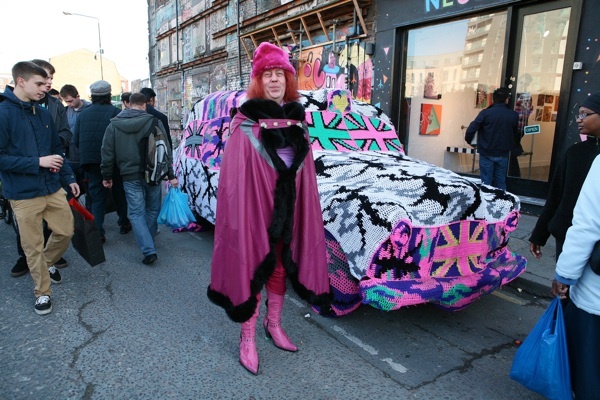 Mark Petty is back in Brick Lane! 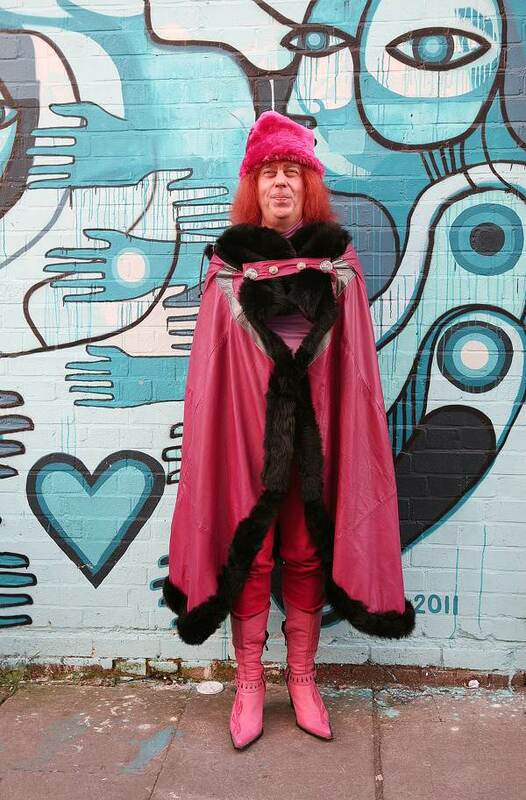 Boudicca Lives! with Kuldip & Guamett Battu of Batty Fashion where Mark’s clothes are made. What a great joy to see Mark back! And that outfit is the absolute mostest! Well done Mark! Good to see you back! Glad to see you back, Mark. 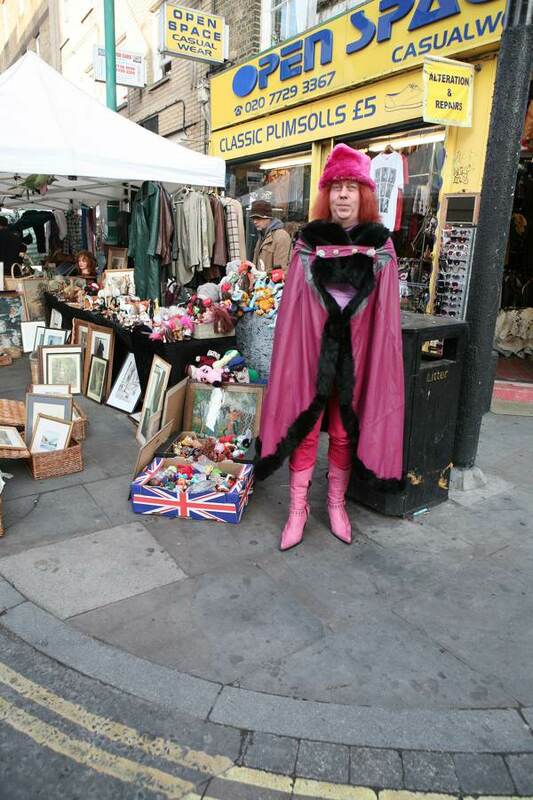 Spitalfields was the poorer without you. 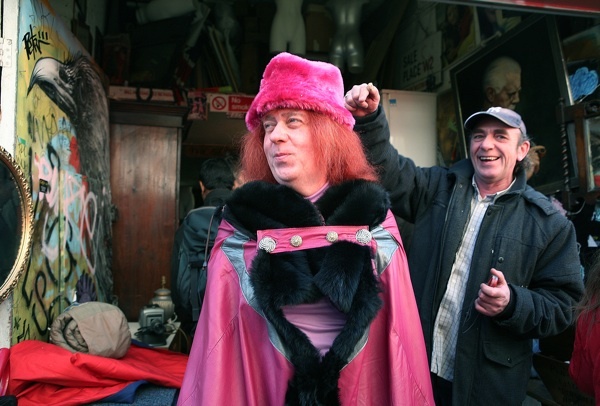 hurray for Mark ….what a beacon of light you are . Never let them get you down Mark , look at all the love and good heartedness you inspire when you sail forth into the world. 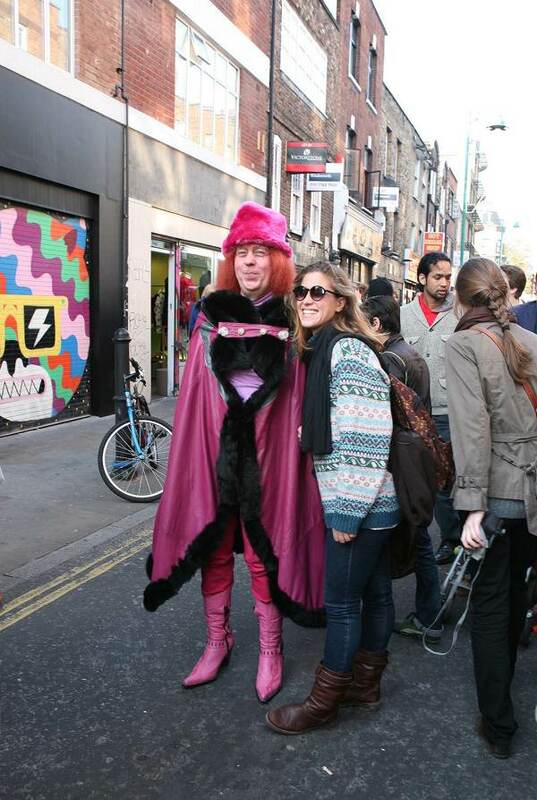 nice to see that you cause an interest in the peoples market at the top of cheshire street , we need more of this , marks a lively part of cheshire street in his colourfull outfits. 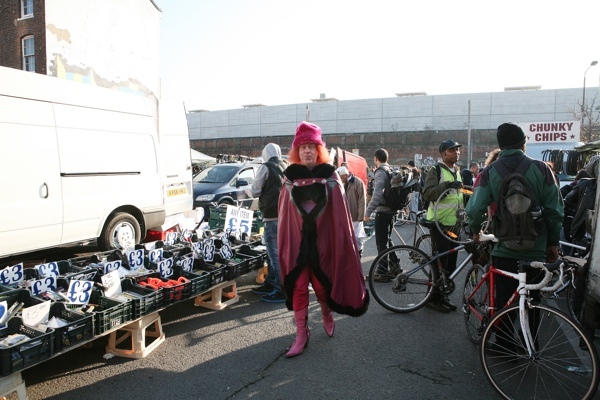 Its always been the peoples market but unfortunately the council do there best to stop it .